← The Making of a Gingerbread House. After posting about my gingerbread church, I wanted to share the recipe used for its creation. This comes courtesy of my former cake decorating instructor, Debbie. I’m posting it as written – for a low-sodium diet simply eliminate the salt, substitute twice the amount of sodium-free baking soda, and be sure to use molasses with the lowest sodium possible. I prefer Grandma’s Original Unsulphured Molasses (15 mg per Tbsp) or Crosby’s Gold Star Molasses (0 mg per Tbsp). This recipe not only works well for construction pieces but tastes great too! For a crisper texture in the damp weather (or for those on a low-sodium diet) the salt may be omitted. This will yield enough dough for an average size (12 x 12-inch) building with some leftovers for cookies. To minimize variations from your pattern sizes due to movement of dough, roll out ONTO cookie sheets, then cut patterns, carefully removing dough from between each cut. Chill dough thoroughly before baking. This also helps keep pieces true to size, crucial in any construction project. Mix 5 cups flour, spices, baking soda and salt (if using) in a large bowl. Set aside. Cream butter, shortening and sugar in bowl of a large mixer. Add molasses & beaten eggs and blend well. Gradually add the dry ingredients, mixing until combined. Turn mixture out onto a lightly floured surface and, if necessary, knead in the remaining 1/2 cup flour. Dough should be firm and smooth. Allow it to rest about an hour for best rolling results. Dough may be chilled 15-30 minutes before rolling, if time is a factor. Preheat oven to 350 degrees. Lightly grease cookie sheets. Cooking spray may be used. 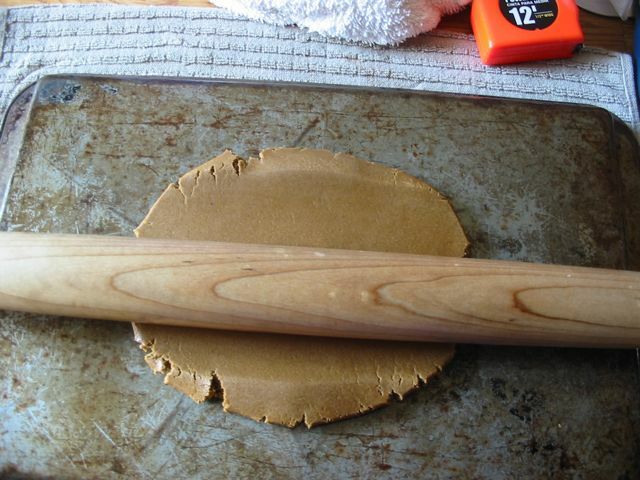 Roll out dough directly onto your cookie sheets. If your cookie sheets have sides, flip them over and roll out on the flat back side. Use a dish towel to keep cookie sheets from sliding. Baking time will vary according to the thickness of the rolled dough. For thinly rolled smaller pieces, bake 5-8 minutes. For larger, thicker pieces (about 1/8th-inch thick), bake 10-15 minutes. Be sure to watch dough as baking time nears an end to avoid burning or over-browning. Cool cookies on wire racks. Dry pieces overnight on a flat surface covered with paper towels. Leftover dough may be wrapped in plastic and kept in the refrigerator for weeks. Bring to room temperature before rolling. This entry was posted in Holiday baking and tagged gingerbread, How to build a gingerbread house, low sodium gingerbread. Bookmark the permalink. Wondering how this would taste raw. Because a really good plan, in my mind, is whipping up a batch of this, driving to the local grocery store, picking out a pre-made gingerbread house kit, and eating this while I decorate it. Katie, you are so bad it’s good.